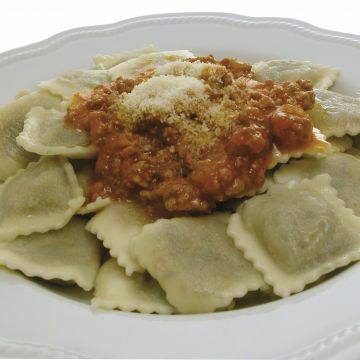 This dish that today is regarded as somewhat of a ‘luxury meal’, eaten on special occasions, was in fact traditionally eaten the day after the celebrations, as ravioli were invented as a way of using up leftovers that would end up in the filling. Knead the flour and eggs together adding water a little at a time until you reach a soft and even consistency. Cover with one damp and one dry tea towel and leave to rest for an hour. Peel and boil the vegetables for 10 minutes in lightly salted water, drain and chop finely. Transfer the chopped vegetables into a mixing bowl and add the remaining ingredients. Put the mushrooms to soak in warm water. 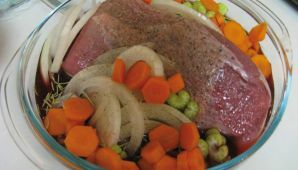 In a casserole dish, heat a little oil and add the chopped onion and mushrooms; add the meats and turn until browned all over. Add a little white wine and allow it to evaporate. Add salt and finish cooking. Now par-boil the brains and offal and remove the membrane, then chop finely and add to the other meats. Add the meats to the vegetables in the mixing bowl, add the eggs, marjoram and chopped garlic, a handful of parmesan cheese, the soaked bread and then mix everything together seasoning with salt, pepper and the mixed spices. Now take the dough and roll out two identical thin layers, until they are almost translucent. Spoon the filling into evenly spaced small piles about 3 cm apart, then cover with the other layer of dough, pressing it together in the spaces between the fillings. 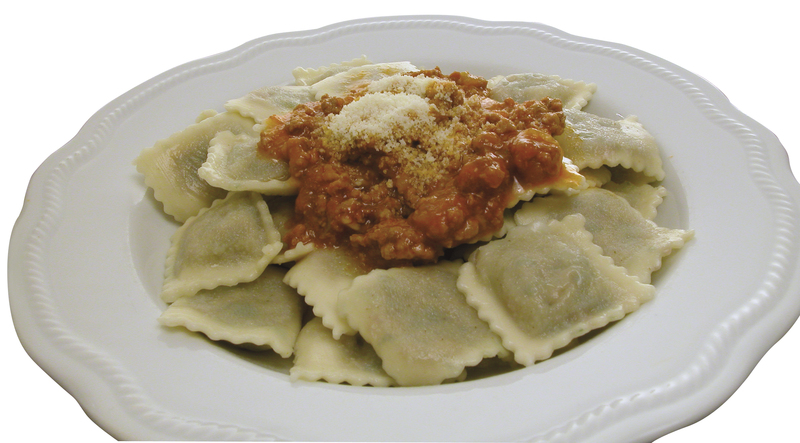 Separate the ravioli with a roller cutter and cook in salted boiling water. When they float to the surface of the water they are ready. Serve with tocco sauce.